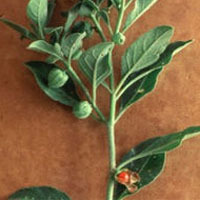 Ashwagandha, which belongs to the pepper family, is found in India and Africa. The roots of ashwagandha are used medicinally. A combination of boswellia, ashwagandha, turmeric, and zinc effectively treated pain and stiffness in one study, without the stomach irritation that is a common side effect of NSAIDs. Ashwagandha stimulates the immune system and is considered a tonic or adaptogen—an herb with multiple actions that counteract the effects of stress and generally promote wellness. Ashwagandha may be helpful for reducing the effects of stress, including chronic psychological stress. The health applications for ashwagandha in traditional Indian and Ayurvedic medicine are extensive. Of particular note is its use against tumors, inflammation (including arthritis), and a wide range of infectious diseases.1 The shoots and seeds are also used as food and to thicken milk in India. Traditional uses of ashwagandha among tribal peoples in Africa include fevers and inflammatory conditions.2 Ashwagandha is frequently a constituent of Ayurvedic formulas, including a relatively common one known as shilajit.